TRAILERING EQUIPMENT includes trailer hitch, 7-pin and 4-pin connectors (Includes (G80) locking rear differential on 2WD models. SUSPENSION PACKAGE, OFF-ROAD includes Z71 chrome side front fender emblems, monotube Rancho brand shocks and (K47) air cleaner, (JHD) Hill Descent Control, (NZZ) underbody shield Includes (UHN) 18" x 8.5" (45.7 cm x 21.6 cm) bright machined aluminum wheels. SUSPENSION PACKAGE OFF-ROAD includes Z71 chrome side front fender emblems monotube Rancho brand shocks and (K47) air cleaner (JHD) Hill Descent Control (NZZ) underbody shield Includes (UHN) 18" x 8.5" (45.7 cm x 21.6 cm) bright machined aluminum wheels. Scores 22 Highway MPG and 16 City MPG! This GMC Sierra 1500 boasts a Gas V8 5.3L/325 engine powering this Automatic transmission. WIRELESS CHARGING, WINDOW, POWER, REAR SLIDING WITH REAR DEFOGGER, WHEELS, 18" X 8.5" (45.7 CM X 21.6 CM) BRIGHT MACHINED ALUMINUM. *This GMC Sierra 1500 Comes Equipped with These Options *SUSPENSION PACKAGE, OFF-ROAD includes Z71 chrome side front fender emblems, monotube Rancho brand shocks and (K47) air cleaner, (JHD) Hill Descent Control, (NZZ) underbody shield Includes (UHN) 18" x 8.5" (45.7 cm x 21.6 cm) bright machined aluminum wheels., SLE VALUE PACKAGE includes (AG1) driver 10-way power seat adjuster when ordered with (AZ3) seats only, (N37) manual tilt and telescopic steering column, (BTV) Remote vehicle starter system, (T3U) LED front fog lamps, (UG1) Universal Home Remote, (C49) rear-window defogger, (KI4) 110-volt AC power outlet, (CJ2) dual-zone climate control, (Z82) trailering equipment, and (G80) rear locking differential for 2WD models only, SLE CONVENIENCE PACKAGE includes (JF4) power-adjustable pedals, (UD7) Rear Park Assist, (C49) rear-window defogger and (A48) sliding rear window, ALL-TERRAIN PACKAGE includes (CGN) spray-on bed liner, (UHN) 18" x 8.5" (45.7 cm x 21.6 cm) bright machined aluminum wheels, (Z71) Off-Road Suspension Package with monotube Rancho shocks, (NZZ) underbody shield, (UD7) Rear Park Assist, (B58) carpeted floor mats, (VB5) front body-color bumper, (DD8) auto-dimming inside rearview mirror, (VT5) rear body-color bumper with corner steps, unique grille with body color surround and chrome accents, bright sill plates and All-Terrain cluster. All-Terrain side emblem replaces Z71 side emblem. Includes (T3U) LED front fog lamps, (Z82) Trailering equipment, (A95) front bucket seats, (DL3) chrome full-feature mirrors, (B85) chrome side moldings, (E20) chrome door handles and (DP9) chrome mirror caps. , UNIVERSAL HOME REMOTE, UNDERBODY SHIELD, TRANSFER CASE PROTECTION, TRANSMISSION, 6-SPEED AUTOMATIC, ELECTRONICALLY CONTROLLED with overdrive and tow/haul mode. Includes Cruise Grade Braking and Powertrain Grade Braking (STD), TRAILERING EQUIPMENT includes trailer hitch, 7-pin and 4-pin connectors (Includes (G80) locking rear differential on 2WD models., TRAILER BRAKE CONTROLLER, INTEGRATED, TIRES, P265/65R18 ALL-TERRAIN, BLACKWALL. 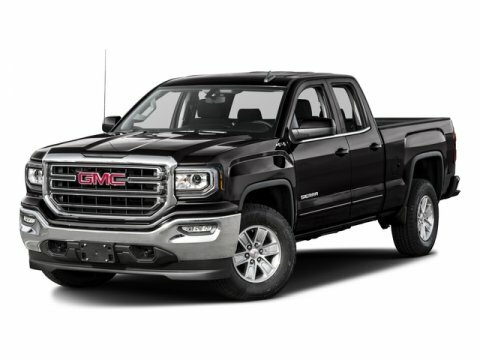 * Stop By Today *For a must-own GMC Sierra 1500 come see us at Bleecker Buick GMC, 926 E 4Th Ave, Red Springs, NC 28377. Just minutes away! Certain data and other content displayed herein is copyrighted. All rights reserved. All vehicles are subject to prior sale. While every attempt has been made to ensure the accuracy of the data displayed, HomeNet Automotive and the Dealer (Bleecker Buick GMC Used) are not responsible for any errors or omissions. All information is gathered from sources that are believed to be reliable, but no assurance is given that this information is complete and we cannot assume any responsibility for errors or omissions or warrant the accuracy of this information. * Based on 2016 EPA mileage estimates, reflecting new EPA fuel economy methods beginning with 2016 models. Use for comparison purposes only. Do not compare to models before 2008. Your actual mileage will vary depending on how you drive and maintain your vehicle.